Postpartum hemorrhage (PPH) is the leading cause of maternal mortality in most developing and low-income countries and the cause of one-quarter of maternal deaths worldwide. With appropriate and prompt care, these deaths can be prevented. With the current and rapidly developing research and worldwide access to information, a lack of knowledge of the best medical practice should not be a barrier. It is argued that quality distance learning can bridge the gap between available information and dissemination around the world. The module was developed using current guidelines from the World Health Organization and Royal College of Obstetricians and Gynaecologists and reviewed by specialists in obstetrics and gynecology. Before it was disseminated, it was pilot tested by 127 professionals who identified obstacles within the module that were then rectified. To date, 1329 mostly working age healthcare providers in 77 countries have taken the online training course. Results of the assessment test were recorded on a database and managed by the Geneva Foundation for Medical Education and Research (GFMER). In this article, we describe and evaluate a distant learning module “Evidence-based Management of Postpartum Hemorrhage”, to support the argument that distant learning can be a means of providing quality training courses to health professionals. It can overcome barriers due to distance, financial or time constraints and provide access to continuing medical education when time and distance or both separate the source of information and the health professionals. Abawi, K., Gertiser, L., Idris, R., Villar, J., Langer, A., Chatfield, A. & Campana, A. (2017). A large-scale Internet /computer-based, training module: dissemination of evidence-based management of postpartum hemorrhage to front-line health care workers. 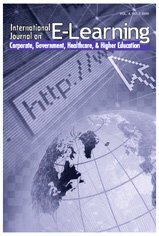 International Journal on E-Learning, 16 (4), 317-328. Waynesville, NC USA: Association for the Advancement of Computing in Education (AACE). Retrieved April 22, 2019 from https://www.learntechlib.org/primary/p/151263/. Cook, D.A. (2007). Web-based learning: pros, cons and controversies. Clinical Medicine (London, England), 7(1), 37–42. Davis, D., O’Brien, M.A., Freemantle, N., Wolf, F.M., Mazmanian, P., & Taylor-Vaisey, A. (1999). Impact of formal continuing medical education: do conferences, workshops, rounds, and other traditional continuing education activities change physician behavior or healthcare outcomes? JAMA, 282(9), 867–874. Gordon, M., Chandratilake, M., & Baker, P. (2013). Low fidelity, high quality: a model for e-learning. The Clinical Teacher, 10(4), 258–263. Lewis, K.O., Cidon, M.J., Seto, T.L., Chen, H., & Mahan, J.D. (2014). Leveraging e-learning in medical education. Current Problems in Pediatric and Adolescent HealthCare, 44(6), 150–163. Liu, S.-H., Liao, H.-L., Pratt, J.A., Liu, S.-H., Liao, H.-L., & Pratt, J.A. (2009). Impact of Media Richness and Flow on E-Learning Technology Acceptance. Computers& Education, 52(3), 599–607. Retrieved from http://www.editlib.org/p/66899/ Royal College of Obstetricians and Gynaecologists (2009). Prevention and management of postpartum haemorrhage. Green-top Guideline No. 52. London: RCOG. Ruggeri, K., Farrington, C., & Brayne, C. (2013). A global model for effective use and evaluation of e-learning in health. Telemedicine Journal and E-Health: The Official Journal of the American Telemedicine Association, 19(4), 312–321. Tsai, C.-C., Chuang, S.-C., Liang, J.-C., & Tsai, M.-J. (2011) Self-Efficacy in Internet-Based Learning Environments: A Literature Review. Educational Technology& Society. 14(4):222-240. World Health Organization (2009). WHO guidelines for the management of postpartum haemorrhage and retained placenta. Geneva: World Health Organization. World Health Organization (2012). WHO recommendations for prevention and treatment of postpartum haemorrhage. Geneva: World Health Organization.